The pioneer who gate-crashed his way to the top Subhash Chandra, the promoter of Essel/ Zee Group, is an unlikely mogul. Hailing from a small town in Haryana, where his family ran grain mills, Chandra has been a perennial outsider, repeatedly aiming high and breaking into businesses where he was considered an interloper. Starting work as a teen to pay off family debts, Chandra had to rely on bluff, gumption and sheer hard toil to turn things around. A little bit of luck and political patronage saw him make a fortune in rice exports to the erstwhile USSR. Always a risk-taker, Chandra then had the vision of getting into broadcasting early, even as established media players failed to see its potential. His Zee TV, India’s first private Indian TV channel, changed the rules of the game and tickled the fancy of a public starved of entertainment. Several gutsy initiatives followed, though not all of them were successful. Chandra’s attempts to launch satellite telephony and a cricket league came to a cropper. But the man continues to reinvent himself; he is now also focusing on infrastructure and smart cities. This is an unusually candid memoir of a truly desi self-made businessman who came to Delhi at age twenty with seventeen rupees in his pocket. Today, he has a net worth of $6.3 billion and annual group revenues of about $3 billion. 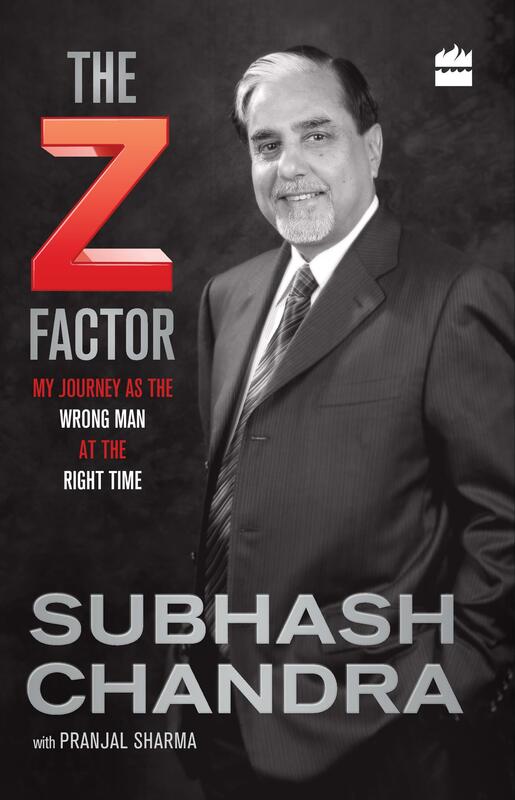 The book is an autobiography of the business tycoon Subhash Chandra. He wrote this book with Pranjal Sharma, who is himself a big name in print, digital and TV media. The personal and professional life of Subhashji is revealed through twenty-seven chapters. With every chapter’s name, a tagline is associated to describe well a specific span of his struggle. A lot is mentioned in the book. Subhashji had belonged to a settled family but leaving all the comfort he strived for the challenging path to shape his destiny more shiner. While reading I got the feeling that there must be more parts of the story which were left due to the words limitation or covering the core incidents. It’s inspirational to read that during the downfall of how he fought against all the difficulties and recovered his family and business. He had accepted the peril in the new business and emerged as a leader by overcoming all the odds. He took a lot of risks with time and proved himself. His life was not an easy one and maintaining a position was a big challenge. With professional growth, he kept learning from his past mistakes. Subhashji has accepted openly where he was wrong in making decisions. His life has been full of struggle but here the significant and remarkable thing is that he chose this life for himself and never criticized. The best way to know a business magnate is to go through his own written book. He was greatly influenced by his grandfather and the impact was reflected in his deeds. He relocated from a relaxed business and confronted jeopardies. He always believed in himself. He was a positive thinker and thought out of the box. He timely identified the opportunities and knocked them. Subhashji has openly accepted and mentioned how he has gone through all of this. At times he bribed, requested and made all possible efforts to continue the advancements. He had relations with the Gandhi families and many others. He has revealed all in this book. This book is a very good example of the proverb ‘no pain no gain’. He took the risks and discomfort of the new ventures in his life and get rewarded. One can’t say that it’s only luck who bought him to this position. The efforts he made in his businesses with not giving up attitude is worth imitating. He openly comprehended the unusual or erroneous decisions he took at times. From seventeen rupees in hand to a billionaire journey is certainly full of excitement. He has been a follower of Vipassana (a meditation form) and mentioned how it helped him during his tough stretch. He had responsively regretted on what he couldn’t do. As per my understanding, this book belongs to a variety of reader, to name a few -entrepreneurs, motivation seekers, novel lovers, and learners etc. He has shared his life through this book and left it on readers to learn as per their intellectuals. Previous Consulting Firms – Giving Professional Advices That Help You Make Right Choices. Seems to be a great read. I loved reading your review. Would be great if u could review my book too, let me know if you are interested. You can read the back blurb n decide. Such books always motivate me because these are real-life experience. And its true, if you want to achieve something you have to come out from your comfort zone. I didnt know about him. Will read this book. Wow this autobiography seriously is inspiring me to read it. I have heard about Subhash Chandra Sir and we all have been a part of his journey how he made Zee group of TV channels. Amazing and inspiring post. Subhash Chandra is the inspiring men. His autobiography seems to be quite impressive. Definitely, read this book. Great thoughts.